The Park SService only exists to beat up veterans on Obama’s orders. Absolutely no reason for Federal Parks. The land, hook, line and sinker should belong to the state and they can do as they wish. I’ve logged many miles on the Parkway. It’s the easiest way back and forth between Baltimore and DC and, when there’s little to no traffic, a beautiful trip. This road probably carries more spooks per mile than any other in the US. And the woods around the NSA (”Fort Meade”) exits are crawling with commandos in black armed to the teeth. Not saying he’s wrong, but the rest of Maryland isn’t exactly a well-oiled traffic machine. Breaking: bureaucrats are lazy, callous and inefficient. Let’s put them in charge of delicate surgeries. I spent a cold winters night in those woods along the parkway (MDNG) with cars whizzing by. I remember thinking do people realize that solders are in these woods. It’s a similarly bad drive on the George Washington Parkway (Virginia). From Alexandria to the 14th Street Bridge, lots of potholes which haven’t been fixed. I remember this road being terrible in the 1960s. It has always been bad. You always knew when you were on the Baltimore Washington Parkway. More than once Ive wished I had photographed some of the roads here in Massachusetts. They often look like what I imagine the roads in a poverty-stricken post Soviet eastern-Europe state look like. Potholes that you could go fishing in. Not saying hes wrong, but the rest of Maryland isnt exactly a well-oiled traffic machine. You said it. The streets in Baltimore are terrible. And they are just as bad in D.C! 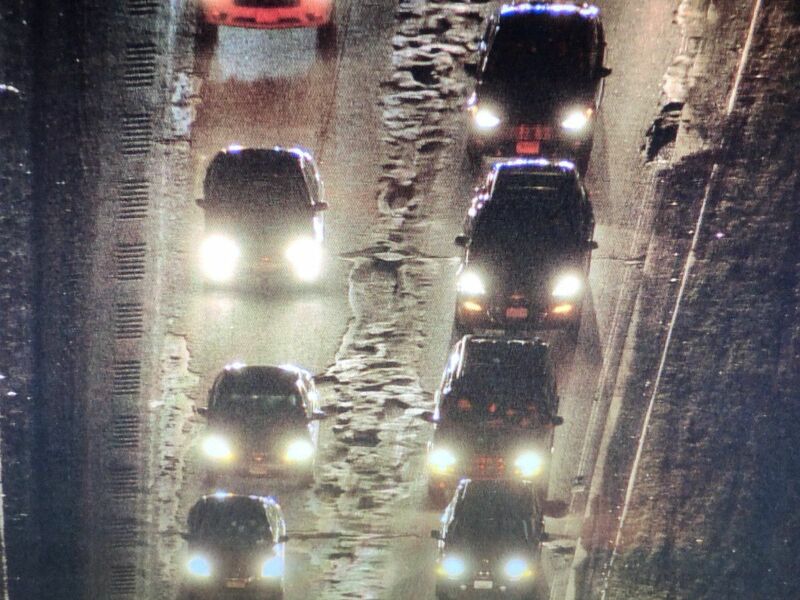 Its a similarly bad drive on the George Washington Parkway (Virginia). Yes the GW Parkway is in sore need of repair. And in the northern section, do something about the trees. If the Park Service actually “owns” these parkways I fail to understand (given the history of park service roads) why they don’t change the naming conventions to “drives” and charge $12 per day to use them. A little bit more information on that location please. I have no idea where that occurred. I remember when it was renamed the Gladys Noon Spellman Parkway after a former congressthing. They must have disliked her. The location is in my post. It occurred in 2014. The location is several miles due north from Baltimore’s Inner Harbor and central business district in the neighborhood known as “Charles Village” that includes Johns Hopkins University campus and accessory properties. Underneath the area is the notorious 25th Street train tunnel that was built decades ago with a nasty zig-zag jog that will eventually bring about a structural collapse. The tunnel carries both freight and AMTRAK traffic. I became aware of the problem back in the mid ‘70’s when one of my economics professors pointed to the strategic value of that piece of rail infrastructure and how its collapse and interruption of service could be construed as a national security emergency. Elected officials of both parties have kicked this can down the road for decades and at some time the piper will need to be compensated. She had been responsible for getting it paved with asphalt. In the 70s and 80s it was all concrete slabs. You'd drive on it and your car would hit each seam with a nice bang. It now being 2019, with little or no maintenance, I'd say her accomplishment has reached its sell-by date. This story was featured on The Science Channel’s “Engineering Catastrophes”.